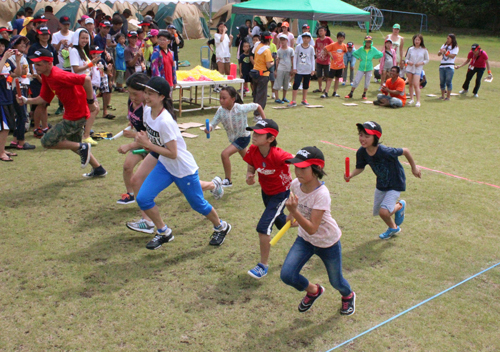 Children from different countries took part in the intercultural event, enjoying a relay at a sports festival at Ada Elementary school in Kunigami around 11 a.m. on the morning of August 20. An event aimed at promoting interaction between children of different countries through nature experiences was held over five nights and six days from August 17 in the Ada district of Kunigami. On August 20, sports events were held at Ada Elementary School in the natural surrounds of Yambaru, bringing smiles to the faces of the children. A total of 140 people took part in the event. Among them, were 74 children from Japan, South Korea, Russia, Mongolia, and China, and 66 staff including teachers from Taiwan and student volunteers from the University of the Ryukyus and Meio University. Sixteen children from Okinawa, including six pupils from Ada Elementary School, took part, and built friendships with the other children. At the farewell party, the participants took photographs of each other and exchanged T-shirts. They promised to reunite. Most of the participants from other countries were visiting Okinawa for the first time. For the event, they stayed at a gymnasium at the school. They rode kayaks, explored an uninhabited island, and made a campfire. They enjoyed the natural environment of Yambaru.